These are probably the most obvious of the fish seen in the waterways of the tropical rainforest. 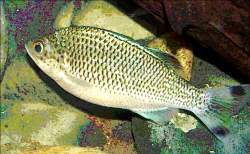 Jungle Perch can be a very pretty silver, gold or olive brown and with dark-edged scales that appear as spots all over the body. They have two dark spots on their tails. If not hunted, they can grow to 30 or 40 centimetres. They can easily be seen in the fresher faster waters in the wet tropics, such as in the swimming pools along the Mossman River, as they are always waiting for a handout.